WB in Rockville Centre. I hate that town just because of the spelling. It insists on being pretentious, despite being unable to produce signs resembling propriety. 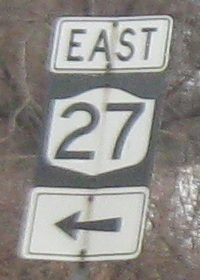 No NY 27 shield? Different typefaces and font sizes? And the arrows are straight out of an airport restroom. It really doesn't work EB, either. I would have thought Merrick to be a county road, but this lack of effort contradicts that presumption. 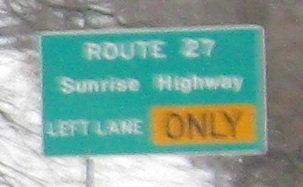 I'm fairly surprised the word "Only" is in the right color scheme (but not font, of course), and that the NY 27 shield isn't a box, Interstate, or something worse. So all that being said, where the hell did state-issued button copy come from? It deserves a better fate than being mixed in with garbage. One other thing Rockville Ctr. has going for it is old crosswalk signs. 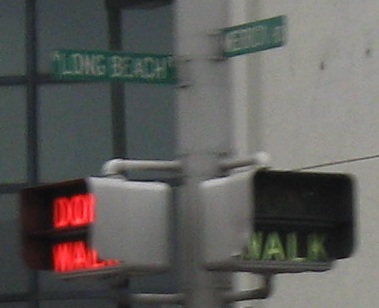 The "walk" is a sickly shade of white that's almost green. WB entering town, courtesy Mike Byrnes. More button copy, WB. 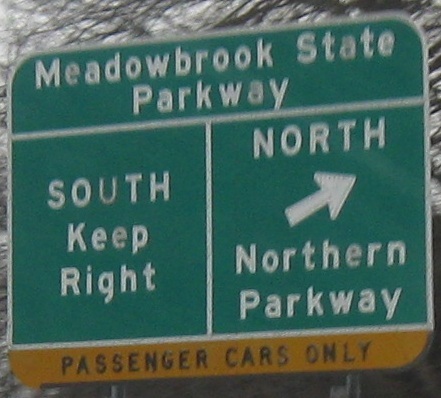 The word "State" is usually omitted from Parkway signs (Taconic being a notable exception), and in fact it's even omitted from this sign for Northern (State) Pkwy. "Keep Right" should be in all caps because it's a directional message, but I won't argue with button copy. EB at the stub beginning of NY 135, and WB courtesy Scott Colbert. 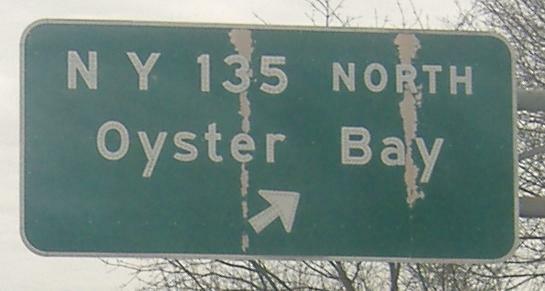 NY 135 has a stub here where it was supposed to continue south from Seaford to Wantagh - check that out at the link below.